Creeping charlie is considered by many to be a nuisance weed in lawns and will infiltrate areas that have been neglected or otherwise poorly managed. Once established within a lawn, creeping charlie may suppress the growth of surrounding plants, due to a characteristic called “allelopathy”. An allelopathic plant will produce biochemicals that deter the fitness of surrounding plants. One study (Rice, 1986) found that flowers growing alongside creeping Charlie experienced decreased seed germination and faster rates of root and shoot growth. An effective way to exclude creeping charlie from your home lawn is by practicing responsible lawn species selection. In shaded areas where creeping charlie often thrives, it is important to utilize grasses like the fine fescues (Festuca spp), which are known to perform well in Minnesota. In the northern climates of the United States, Kentucky bluegrass is the most common species of turfgrass. While Kentucky bluegrass is a high quality turfgrass that performs well in terms of winter hardiness, this species of grass struggles in shady areas. Both tall fescue (Festuca arundinacea) and fine fescue (Festuca spp.) are cool-climate turfgrass species that do well in shady areas. Mixing fescues with Kentucky bluegrass is an effective way to ensure that strong turfgrass density is present despite the shade provided by common yard trees. In addition to employing careful turfgrass species selection, it is important to utilize best practices in lawn care including mowing, irrigation, and fertilizer to ensure proper turfgrass health and density. management. When creeping charlie is present in low numbers, it may be possible to control the weed via hand weeding. When hand weeding, it is critical to remove the roots as well as the above ground portion of the plant to ensure that there is no re-emergence. Due to the aggressiveness of creeping charlie, it may be necessary to weed the area several times to remove all creeping charlie vegetation and use proper lawn care practices to promote a healthy, thick lawn instead of creeping charlie. A study by Price and Hutchings (1986) noted that creeping charlie is less abundant when turfgrass is present, as the grass provides competition for sunlight and soil nutrients. Increasing access to sunlight will improve turfgrass growth, limiting the ability of creeping charlie to spread through the turf lawn. 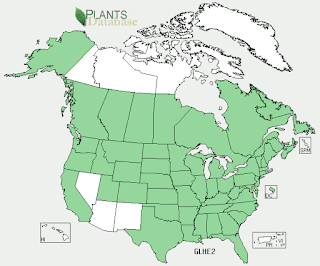 There are several options for eradicating creeping charlie when it has taken over a lawn. Typically use to cut sod for lawn renovation, a sod cutter may also be used to quickly remove strips of weeds, like creeping charlie, from a lawn. 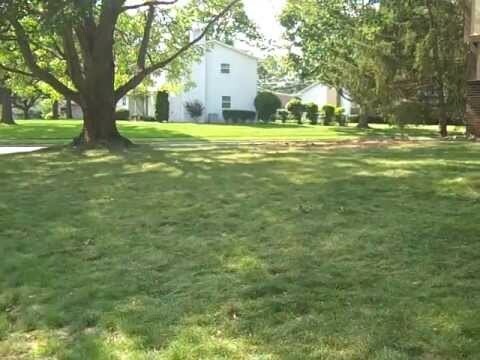 This will result in an area of bare soil within the lawn. Be sure all creeping charlie vegetation is eradicated to prevent re-invasion. If any piece of plant material is not removed, there is potential for creeping charlie to re-establish within the lawn. After all creeping charlie vegetation is removed, the areas of bare soil should be seeded with high quality turfgrass suited to the site conditions (soil type, amount of sun/shade, plant hardiness zone) to ensure dense, uniform germination throughout the area. Lawns with dense turfgrass coverage are less susceptible to weeds like creeping charlie. A second option for removing a large area creeping charlie from a lawn is through solarization, a method for killing plant material and soil pests that involves anchoring clear plastic sheeting over the area during the warm months of spring and summer. 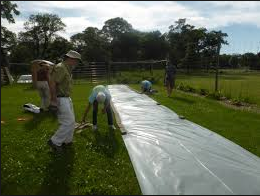 The clear plastic sheet captures heat and sunlight, raising temperatures to the point where grasses and weeds can no longer survive. Solarization is best fit for sunny, flat sites that are less than 1/4 of an acre in size. Note: In cooler, shaded areas (where creeping charlie is likely to be found) the process of solarization takes the better part of a growing season, typically 5-6 months, or up to a full year in some instances. Additional information on solarization can be found through the Xerces Society. The plastic should be removed in the late fall when soil temperatures are 35-55°F so that the area can be dormant seeded. Dormant seeding is done at these temperatures because the soil is too cold for germination to occur, but the ground is not yet frozen. This ensures that the target species seeded into the newly prepared area will germinate in the spring when temperatures have reached the proper number of degree days. If seeded properly, the new turfgrass area should be dense, uniform, and free of weed pressure. An additional strategy for removing a creeping charlie infestation is the use of chemical herbicides, specifically herbicides that include glyphosate and/or triclopyr as active ingredients. While this can be a less ecologically-friendly solution, it is an effective form of weed management. Applications of herbicides are most effective on warm, calm days when plants are actively growing. It is important to avoid windy days to ensure that herbicide applications do not drift onto non-target plants. Glyphosate treatments are most effective when two treatments are applied, with the second treatment taking place 7-10 days after the initial treatment. After the creeping charlie has been removed, high quality grass seed should be overseeded onto the turf lawn. IMPORTANT: A pesticide label is a legal document. Always follow the pesticide label directions attached to the pesticide container you are using. Pesticide labels may change frequently. Internet labels may not match the label on the container you are using. The site of use or plant to which the pesticide is to be applied must be listed on the label or the pesticide cannot be used. Remember, the label is the law. For people that live in an area where letting creeping charlie grow is not a problem for neighbors, creeping charlie employs a unique strategy to attract some bee visitors, such as sweat bees, bumble bees, and honey bees, that is tied into how the flower produces nectar. The flowers have a unique strategy for rewarding visitor pollinators, commonly referred to as the “lucky hit” strategy. Creeping charlie flowers produce an average of 0.3 ml of nectar per flower, but the amount of nectar in any one flower varies greatly, ranging from 0.06-2.4mL. When 805 creeping charlie flowers were sampled for nectar quantity, it was found that only 8% (64/805) of these flowers had a large volume of nectar, and the rest had almost none (Southwick et al. 1981). The availability of nectar also varies throughout the day. As the morning fades into afternoon, “lucky hits” become less frequent, as creeping charlie flowers do not replenish their nectar throughout the day. Most flowers produce their nectar at night or in the early morning, so it is believed that all the “lucky hits” available in the afternoon are ones that were missed by bees earlier in the day. One researcher (Southwick et al. 1981) found that bees foraging on creeping charlie for 5.9 minutes obtained enough nectar from the flowers to make foraging energetically profitable. While creeping charlie can be a good nectar source, we are not recommending that you let it take over your lawn. In addition to the issues associated with nectar production, pollen (the main protein source for bees) from creeping charlie is not readily available to visiting bees and other insect pollinators. 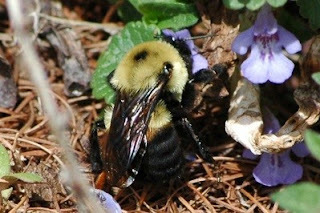 Bees need a variety of food sources, and the best lawns have many kinds of flowers, hopefully with a range of bloom times. Creeping charlie is invasive and can prevent you from growing additional flowers in your lawn. Instead, if you are looking to promote pollinator health in your lawn or garden, we recommend planting a diversity of flowers that produce high quality nectar and pollen consistently. That being said, if your lawn/garden is already overrun with creeping charlie, and you have not had a chance to eradicate it yet, you can at least take pleasure in seeing the bees buzzing around it, and note when they spend extra time on one bloom. They are likely hitting the jackpot! Hultén, E. 1971. The Circumpolar Plants. II. Dicotyledons. Almquist & Wiksell, Sweden. Rice, E.L. 1986. Allelopathic growth stimulation. The Science of Allelopathy (eds A.R. Putnam & C.S. Tang), pp. 34-40. Wiley, Chichester, UK. Southwick, E. E. "Lucky Hit" nectar rewards and energetics of plant and pollinators." Comparative Physiology and Ecology 7.2 (1982): 51-55. Southwick, Edward E., Gerald M. Loper, and Steven E. Sadwick. "Nectar production, composition, energetics and pollinator attractiveness in spring flowers of western New York." American Journal of Botany (1981): 994-1002.